Posted Jun 12 2008, 1:07 am in Contest, Release day, Who's Been Sleeping in My Bed? Starting June 12 through July 10–Win one of four San Juan gift bags, which will have several items purchased in the San Juans. The first winner will be drawn from my Yahoo newsletter list and comments on my blog on June 12 at 6:30 pm PDT. Check my blog tomorrow or Siren-Bookstrand’s Yahoo Group for more information. 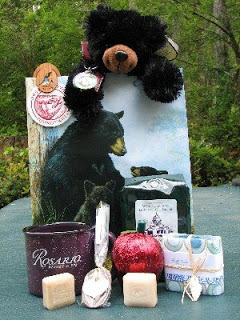 It is Pictured on the left, it includes: wooden Orcas Island bookmark, Rosario Yacht Club sticker, Teddy bear, Orcas Island key chain, Rosario coffee mug, chocolate spoon, soaps, chocolate apple, and gourmet coffee. I’ve been waiting for this release party and now that I see the prize I am really exxcited. Congrats for tomorrow. Thanks Robyn, I hope to see you there. I’m so excited for you!! Hey, and maybe I’ll win a prize…you just never know. Love the website, great pic of hubby (you should let people know he’s not nearly as mean as he looks) Good luck with the book release, wish I could be there to share the fun! The gift bag your contest is precious and thoughtful. 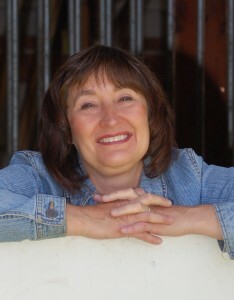 The Jami Davenport web site is great! Everybody should check it out!